Altitude affects cars in the same way it affects humans. The higher you climb, the less oxygen there is in the air and it becomes harder to breathe and function. 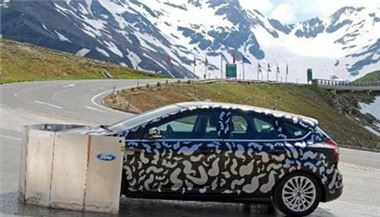 Ford demands its products meet high standards of performance at all altitudes which is why the company frequently heads to the Austrian Alps and to the Grossglockner High Alpine Road. Completed in 1935, this breathtaking and beautiful ribbon of tarmac weaves its way right into the heart of the Hohe Tauern National Park, before terminating opposite the tallest mountain in Austria, the Grossglockner (3,798m) and its glacier, the Pasterze. At 48km long, with 36 challenging bends and a maximum altitude of 2,504 metres, this masterpiece of road engineering is a mecca for motorcyclists and driving enthusiasts. It's also the perfect location to carry out altitude testing on the next generation Ford Focus. Ford vehicle integration engineer Bernd Herweling is here for two weeks, driving 200km up and down the hill every day. “We’re here testing next generation Focus with a variety of powertrains, both petrol and diesel," he explains. "We’re evaluating driveability on steep mountain roads from a customer perspective. The bottom line is we’re here to find out how the car performs driving up and down seriously steep hills. Today the team is testing a highly camouflaged Focus equipped with the all-new 1.6-litre Ford EcoBoost direct-injection turbo petrol engine. Bernd drives while his colleague Markus Polle sits in the passenger seat monitoring a laptop which displays the ambient temperature, oil temperature and a myriad other readings. On the back seat there's a dozen or so plastic fuel cans filled with ballast which weigh the same as three heavy adults. It costs 28 Euros for a day's driving on the Grossglockner High Alpine Road. After exiting the toll booth at the bottom of the valley, the road shows it character straight away, climbing steeply in a straight line before launching into a series of hairpin bends. Bernd pushes the Focus hard. Mostly he's in second or third gear but on some of the tighter bends he drops down to first. He overtakes one, two, three coaches and several exotic sports cars, gaining height with dizzying speed. The scenery is simply stunning but this road demands maximum concentration as there are huge drops at the side and no barriers. Ears pop as the Focus climbs ever higher and then, just a few minutes after leaving the valley floor, Bernd brakes to a halt in a lay-by at the top of the pass, switches the engine off and erects a wind deflector around the hood to trap heat inside the engine compartment. "It's a heat soak," he says. "We want the engine to stay as hot as possible. Going uphill we’re carefully motoring the engine cooling system, radiator temperature, engine oil temperature and in the case of automatic models, transmission oil temperatures. 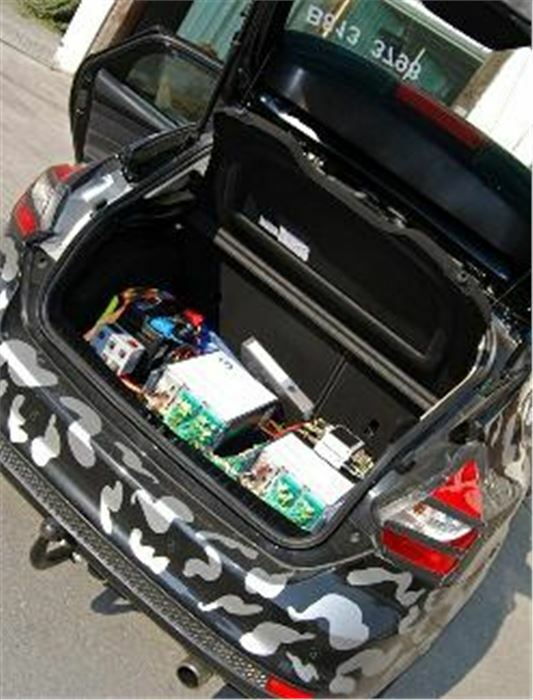 "We have more than 100 electronic channels on board which record how the vehicle is performing. It’s a lot of information. So far everything is working fine. My job is to drive quite fast but not to the limit. We could go a lot faster!" As Bernd and Markus analyse their laptop readings a crowd of people gather round the camouflaged Focus. Some take photographs, many press against the windows to get a glimpse inside. "This happens a lot," Bernd explains later. "When the car is stationary people do try to look inside. If we drive past someone often they will turn to look twice because it is different. People are curious. If someone wants to take pictures you can’t avoid it. The camouflage does help though. We're always aware of what's happening, but we can just get on and concentrate on our job." After five minutes it's time to head back down. Going up hill the clutch and engine suffer most but now it's the turn of the brakes to be punished. At the side of the road numerous signs warn drivers to select a low gear and use their brakes sparingly. Bernd, however, brakes very late for each bend. Thankfully the Focus is as surefooted as a mountain goat. 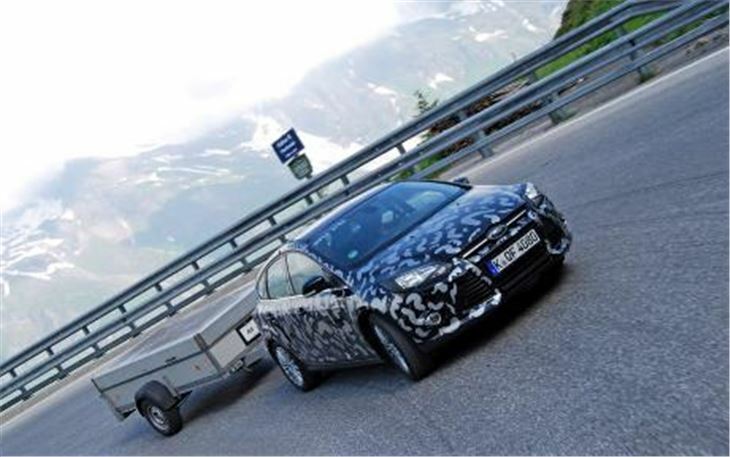 As we near the bottom another camouflaged Focus towing a hefty four-wheeled trailer sets off up the mountain. Bernd explains that the driver's brief is to stay at a steady 30kph all the way to the top. At that speed there's little air flow through the radiator so the engine cooling system faces a stern work-out. "Trailer testing is very important," adds Bernd. "At sea level in this car you can pull up to 1,500kg with this powertrain. But up here in this rarefied atmosphere the engine is going to struggle. We are pushing the limits to see just how much weight it will pull up the hill and how the clutch copes with hill starts at altitude. "The conditions are extreme," he concluded, "but that's why we are here. If the car meets our performance targets in this environment, it'll cope with pretty much anything our customers will ask of it!"